As US home prices have climbed to within a hair's breadth of their all-time highs from 2006, we've asked time and time again whether this is a market "top" or a "breakout". In each case, we've pointed to slackening transaction volume in some of the hottest housing markets in the US as a sign that, despite a purported paucity of new housing stock during the post-crisis era, high prices have left much of the market out of reach for middle- and working-class Americans (even those who might consider themselves part of the upper-middle class) as asset price appreciation has far outstripped wage growth. And nowhere has this trend been more visible, perhaps, than in Manhattan. To wit: After months of declines, Apartment sales in Manhattan fell in January to the lowest monthly rate since February 2012 (a six year low) as a trend in both declining sales prices and volume has intensified. Across Manhattan, 840 co-ops and condos were sold in January, a 20.1% drop from a year earlier, when 1,051 apartment sales were recorded, according to CityRealty. That's the lowest number of units sold since February 2012, when 799 sales were recorded at an average price of $1.50 million. Volume peaked in July 2013, when 1,721 units were sold. A separate batch of data from the New York City Department of Finance showed 995 units were sold in December, a 15.6% drop. Sales prices also sunk precipitously last month, logging a 15.5% year-over-year drop to an average of $1.86 million in January from an average $2.2 million a year earlier, while the average price in December fell 14.3 percent, from $2.17 million. CityRealty's director of research said she was shocked by the drop. "I’m a little startled, it’s quite a blip," Gabby Warshawer, director of research at CityRealty, said of the drop. One reason for the price decline, Reuters said, was a lack of new condo buildings entering the market. A preponderance of new condos coming online has skewed prices in the market toward upwards of $2 million, Warshawer said. That's skewed the average price of a condo to $2.8 million in January, compared with $1.3 million for co-ops, excluding data from upper Manhattan because of the area’s comparatively low activity. Only 61 units were sold in January. Meanwhile, apartment sales priced above $10 million - the cutoff for the ulta-high-end range - have nearly doubled since 2013. 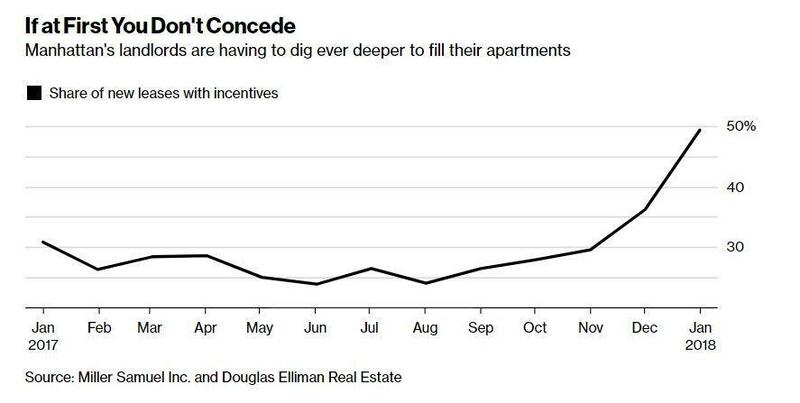 As we pointed out last month, sky-high rents and the skew toward luxury housing is forcing more Manhattan landlords to offer incentives like at least one month rent-free to help entice tenants.